Buddhavacana (trans. "the word of the Buddha") is a comprehensive Pali reader intended to enable a student to move directly into reading the Pali Nikayas. 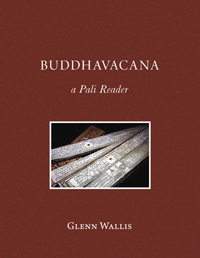 Author Glenn Wallis has selected sixteen suttas, each comprising a section of the book. After each sutta are blank pages where the student can write down their own rendering; a word-by-word guide to the sutta, with brief grammatical annotations; and at the end of the whole book, polished translations by Wallis himself of all the suttas offered for study. A familiarity with basic Pali grammar is recommended; A Pali Primer by Lily De Silva is an excellent guide for this purpose. This eBook is in PDF format, which can be read on any eBook reader which can display PDF files, and on computers. eBooks in additional formats are also available.